This article is about industrial use of a sedimentary rock known as oil shale. For production of crude oil trapped in oil-bearing shales (tight oil), see Tight oil. The oil shale industry is an industry of mining and processing of oil shale—a fine-grained sedimentary rock, containing significant amounts of kerogen (a solid mixture of organic chemical compounds), from which liquid hydrocarbons can be manufactured. The industry has developed in Brazil, China, Estonia and to some extent in Germany and Russia. Several other countries are currently conducting research on their oil shale reserves and production methods to improve efficiency and recovery. Estonia accounted for about 70% of the world's oil shale production in a study published in 2005. Oil shale has been used for industrial purposes since the early 17th century, when it was mined for its minerals. Since the late 19th century, shale oil has also been used for its oil content and as a low grade fuel for power generation. However, barring countries having significant oil shale deposits, its use for power generation is not particularly widespread. Similarly, oil shale is a source for production of synthetic crude oil and it is seen as a solution towards increasing domestic production of oil in countries that are reliant on imports. Oil shale has been used since ancient times. Modern industrial oil shale mining began in 1837 at the Autun mines in France, followed by Britain, Germany and several other countries. The oil shale industry started growing just before World War I because of the mass production of automobiles and trucks and the supposed shortage of gasoline for transportation needs. In 1924, the Tallinn Power Plant was the first power plant in the world to switch to oil shale firing. Following the end of World War II, the oil shale industry declined due to the discovery of large supplies of easily accessible and cheaper crude oil. Oil shale production however, continued to grow in Estonia, Russia and China. Following the 1973 oil crisis, the oil shale industry was restarted in several countries, but in the 1980s, when oil prices fell, many industries faced closure. The global oil shale industry has grown again from the mid-1990s. In 2003, the oil shale development program was initiated in the United States, and in 2005, the commercial leasing program for oil shale and tar sands was introduced. As of May 2007, Estonia is actively engaged in exploitation of oil shale on a significant scale and accounts for 70% of the world's processed oil shale. Estonia is unique in that its oil shale deposit account for just 17% of total deposits in European Union but it generates 90% of its power from oil shale. Oil shale industry in Estonia employs 7,500 people, which is about 1% of national employment, accounting for 4% of its gross domestic product. Oil shale is mined either by traditional underground mining or surface mining techniques. There are several mining methods available, but the common aim of all these methods is to fragment the oil shale deposits in order to enable the transport of shale fragments to a power plant or retorting facility. The main methods of surface mining are open pit mining and strip mining. An important method of sub-surface mining is the room-and-pillar method. In this method, the material is extracted across a horizontal plane while leaving "pillars" of untouched material to support the roof. These pillars reduce the likelihood of a collapse. Oil shale can also be obtained as a by-product of coal mining. The largest oil shale mine in the world is the Estonia Mine, operated by Enefit Kaevandused. In 2005, Estonia mined 14.8 million tonnes of oil shale. During the same period, mining permits were issued for almost 24 million tonnes, with applications being received for mining an additional 26 million tonnes. In 2008, the Estonian Parliament approved the "National Development Plan for the Use of Oil Shale 2008-2015", which limits the annual extraction of oil shale to 20 million tonnes. Oil-shale-fired Eesti Power Plant in Narva, Estonia. Oil shale can be used as a fuel in thermal power plants, wherein oil shale is burnt like coal to drive the steam turbines. As of 2012, there are oil shale-fired power plants in Estonia with a generating capacity of 2,967 megawatts (MW), China, and Germany. Also Israel, Romania and Russia have run oil shale-fired power plants, but have shut them down or switched to other fuels like natural gas. Jordan and Egypt have announced their plans to construct oil shale-fired power plants, while Canada and Turkey plan to burn oil shale at the power plants along with coal. Thermal power plants which use oil shale as a fuel mostly employ two types of combustion methods. 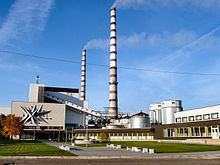 The traditional method is Pulverized combustion (PC) which is used in the older units of oil shale-fired power plants in Estonia, while the more advanced method is Fluidized bed combustion (FBC), which is used in the Holcim cement factory in Dotternhausen, Germany, and was used in the Mishor Rotem power plant in Israel. The main FBC technologies are Bubbling fluidized bed combustion (BFBC) and Circulating fluidized bed combustion (CFBC). There are more than 60 power plants around the world, which are using CFBC technology for combustion of coal and lignite, but only two new units at Narva Power Plants in Estonia, and one at Huadian Power Plant in China use CFBC technology for combustion of oil shale. The most advanced and efficient oil shale combustion technology is Pressurized fluidized-bed combustion (PFBC). However, this technology is still premature and is in its nascent stage. The major shale oil producers are China and Estonia, with Brazil a distant third, while Australia, USA, Canada and Jordan have planned to set up or restart shale oil production. According to the World Energy Council, in 2008 the total production of shale oil from oil shale was 930,000 tonnes, equal to 17,700 barrels per day (2,810 m3/d), of which China produced 375,000 tonnes, Estonia 355,000 tonnes, and Brazil 200 tonnes. In comparison, production of the conventional oil and natural gas liquids in 2008 amounted 3.95 billion tonnes or 82.12 million barrels per day (13.056×10^6 m3/d). Although there are several oil shale retorting technologies, only four technologies are currently in commercial use. These are Kiviter, Galoter, Fushun, and Petrosix. The two main methods of extracting oil from shale are ex-situ and in-situ. In ex-situ method, the oil shale is mined and transported to the retort facility in order to extract the oil. The in-situ method converts the kerogen while it is still in the form of an oil shale deposit, and then extracts it via a well, where it rises up as normal petroleum. Oil shale is used for cement production by Kunda Nordic Cement in Estonia, by Holcim in Germany, and by Fushun cement factory in China. Oil shale can also be used for production of different chemical products, construction materials, and pharmaceutical products, e.g. ammonium bituminosulfonate. However, use of oil shale for production of these products is still very rare and in experimental stages only. Some oil shales are suitable source for sulfur, ammonia, alumina, soda ash, and nahcolite which occur as shale oil extraction byproducts. Some oil shales can also be used for uranium and other rare chemical element production. During 1946–1952, a marine variety of Dictyonema shale was used for uranium production in Sillamäe, Estonia, and during 1950–1989 alum shale was used in Sweden for the same purpose. Oil shale gas can also be used as a substitute for natural gas. After World War II, Estonian-produced oil shale gas was used in Leningrad and the cities in North Estonia. However, at the current price level of natural gas, this is not economically feasible. The amount of economically recoverable oil shale is unknown. The various attempts to develop oil shale deposits have succeeded only when the cost of shale-oil production in a given region comes in below the price of crude oil or its other substitutes. According to a survey conducted by the RAND Corporation, the cost of producing a barrel of shale oil at a hypothetical surface retorting complex in the United States (comprising a mine, retorting plant, upgrading plant, supporting utilities, and spent shale reclamation), would range between US$70–95 ($440–600/m3), adjusted to 2005 values. Assuming a gradual increase in output after the start of commercial production, the analysis projects a gradual reduction in processing costs to $30–40 per barrel ($190–250/m3) after achieving the milestone of 1 billion barrels (160×10^6 m3). Royal Dutch Shell has announced that its Shell ICP technology would realize a profit when crude oil prices are higher than $30 per barrel ($190/m3), while some technologies at full-scale production assert profitability at oil prices even lower than $20 per barrel ($130/m3). To increase the efficiency of oil shale retorting and by this the viability of the shale oil production, researchers have proposed and tested several co-pyrolysis processes, in which other materials such as biomass, peat, waste bitumen, or rubber and plastic wastes are retorted along with the oil shale. Some modified technologies propose combining a fluidized bed retort with a circulated fluidized bed furnace for burning the by-products of pyrolysis (char and oil shale gas) and thereby improving oil yield, increasing throughput, and decreasing retorting time. In a 1972 publication by the journal Pétrole Informations (ISSN 0755-561X), shale oil production was unfavorably compared to the coal liquefaction. The article stated that coal liquefaction was less expensive, generated more oil, and created fewer environmental impacts than oil shale extraction. It cited a conversion ratio of 650 liters (170 U.S. gal; 140 imp gal) of oil per one tonne of coal, as against 150 liters (40 U.S. gal; 33 imp gal) of shale oil per one tonne of oil shale. ^ a b c d e f g h i Dyni, John R. (2010). "Oil Shale". In Clarke, Alan W.; Trinnaman, Judy A. (eds.). Survey of energy resources (PDF) (22 ed.). WEC. pp. 93–123. ISBN 978-0-946121-02-1. Archived from the original (PDF) on 2013-11-09. ^ "Non-Nuclear Energy Research in Europe – A comparative study. Country Reports A – I. Volume 2" (PDF). European Commission. Directorate-General for Research. 2005. EUR 21614/2. Archived from the original (PDF) on 2007-10-25. Retrieved 2007-06-29. ^ Allix, Pierre; Burnham, Alan K. (2010-12-01). "Coaxing Oil from Shale" (PDF). Oilfield Review. Schlumberger. 22 (4): 6. Retrieved 2012-04-18. ^ a b c Laherrère, Jean (2005). "Review on oil shale data" (PDF). Hubbert Peak. Retrieved 2007-06-17. ^ Ots, Arvo (2007-02-12). "Estonian oil shale properties and utilization in power plants" (PDF). Energetika. Lithuanian Academy of Sciences Publishers. 53 (2): 8–18. Archived (PDF) from the original on 2016-10-29. Retrieved 2016-10-29. ^ a b c Dyni, John R. (2006). Geology and resources of some world oil-shale deposits. Scientific Investigations Report 2005–5294 (PDF). United States Geological Survey. Retrieved 2011-11-15. ^ Yin, Liang (2006-11-07). Current status of oil shale industry in Fushun, China (PDF). Amman, Jordan: International Oil Shale Conference. Retrieved 2007-06-29. ^ "Nominations for Oil Shale Research Leases Demonstrate Significant Interest in Advancing Energy Technology. Press release" (Press release). Bureau of Land Management. 2005-09-20. Archived from the original on 2008-09-16. Retrieved 2007-07-10. ^ "What's in the Oil Shale and Tar Sands Leasing Programmatic EIS". Oil Shale and Tar Sands Leasing Programmatic EIS Information Center. Retrieved 2007-07-10. ^ "Tiny Estonia could go nuclear, sees oil shale hope". BBJ. 2008-03-06. Archived from the original on 2015-03-23. Retrieved 2010-10-09. ^ a b c d Francu, Juraj; Harvie, Barbra; Laenen, Ben; Siirde, Andres; Veiderma, Mihkel (May 2007). "A study on the EU oil shale industry viewed in the light of the Estonian experience. A report by EASAC to the Committee on Industry, Research and Energy of the European Parliament" (PDF). European Academies Science Advisory Council: 12–13, 18–19, 23–24, 28. Retrieved 2010-06-21. ^ a b c Bartis, James T.; LaTourrette, Tom; Dixon, Lloyd; Peterson, D.J. ; Cecchine, Gary (2005). "Oil Shale Development in the United States. Prospects and Policy Issues. Prepared for the National Energy Technology Laboratory of the U.S. Department of Energy" (PDF). The RAND Corporation. ISBN 978-0-8330-3848-7. Retrieved 2007-06-29. ^ "Minister of Social Affairs Jaak Aab acquainted himself with the working conditions of the miners" (Press release). Eesti Põlevkivi. 2006-01-25. Archived from the original on 2007-08-14. Retrieved 2007-07-29. ^ "Mining and use of oil shale to be based on interests of state". Ministry of the Environment of Estonia. 2008. Archived from the original on 2008-02-29. Retrieved 2008-03-06. ^ "Riigikogu approves development plan for use of oil shale". Ministry of the Environment of Estonia. 2008. Archived from the original on 2008-12-21. Retrieved 2008-11-02. ^ a b c d e Brendow, K. (2003). "Global oil shale issues and perspectives. Synthesis of the Symposium on Oil Shale. 18–19 November, Tallinn" (PDF). Oil Shale. A Scientific-Technical Journal. Estonian Academy Publishers. 20 (1): 81–92. ISSN 0208-189X. Retrieved 2007-07-21. ^ a b Qian, Jialin; Wang, Jianqiu; Li, Shuyuan (2007-10-15). One Year's Progress in the Chinese Oil Shale Business (PDF). 27th Oil Shale Symposium. Golden, Colorado: China University of Petroleum. Retrieved 2011-05-08. ^ Azulai, Yuval (2011-03-22). "We are not drying up the Dead Sea". Globes. Archived from the original on 2016-03-04. Retrieved 2012-03-15. ^ a b c d Alali, Jamal (2006-11-07). Jordan Oil Shale, Availability, Distribution, And Investment Opportunity (PDF). Amman, Jordan: International Oil Shale Conference. Retrieved 2008-03-04. ^ a b c d e f g h Alali, Jamal; Abu Salah, Abdelfattah; Yasin, Suha M.; Al Omari, Wasfi (2015). "Oil Shale in Jordan" (PDF). Natural Resources Authority of Jordan. Retrieved 2016-10-29. ^ Liive, Sandor (2007). "Oil Shale Energetics in Estonia" (PDF). Oil Shale. A Scientific-Technical Journal. Estonian Academy Publishers. 24 (1): 1–4. ISSN 0208-189X. Retrieved 2007-10-23. ^ Liblik, V.; Kaasik, M.; Pensa, M.; Rätsep, A.; Rull, E.; Tordik, A. (2006). "Reduction of sulphur dioxide emissions and transboundary effects of oil shale based energy production" (PDF). Oil Shale. A Scientific-Technical Journal. Estonian Academy Publishers. 23 (1): 29–38. ISSN 0208-189X. Retrieved 2007-06-16. ^ Agabus, H.; Landsberg, M.; Tammoja, H. (2007). "Reduction of CO2 emissions in Estonia during 2000–2030" (PDF). Oil Shale. A Scientific-Technical Journal. Estonian Academy Publishers. 24 (2 Special): 209–224. ISSN 0208-189X. Retrieved 2007-09-02. ^ a b c d e f g h i j k l m n o p q r s t u v w x y z aa ab ac Burnham, Alan K. (2016-05-18). "2016 EMD Oil Shale Committee Final Report" (PDF). American Association of Petroleum Geologists. pp. 3–10. Retrieved 2017-01-16. ^ Qian, Jialin; Wang Jianqiu (2006-11-07). World oil shale retorting technologies (PDF). International Oil Shale Conference. Amman, Jordan: Jordanian Natural Resources Authority. Retrieved 2007-06-29. ^ Burnham, Alan K.; McConaghy, James R. (2006-10-16). Comparison of the acceptability of various oil shale processes (PDF). 26th Oil shale symposium. Golden, Colorado: Lawrence Livermore National Laboratory. UCRL-CONF-226717. Retrieved 2007-05-27. ^ a b c d e f g h i j k l Li, Shuyuan (2012). "The developments of Chinese oil shale activities" (PDF). Oil Shale. A Scientific-Technical Journal. Estonian Academy Publishers. 29 (2): 101–102. doi:10.3176/oil.2012.2.01. ISSN 0208-189X. Retrieved 2012-05-31. ^ "cross flow retort produces first kerogen oil | Dragon Shale LLC". www.dragonshale.com. Retrieved 2018-10-15. ^ "Eesti Energia Annual Report 2010/2011" (PDF). Eesti Energia. 2011. Retrieved 2012-05-16. ^ a b c Wang, W. D.; Zhou, C.Y. (2009). "Retorting of pulverized oil shale in fluidized-bed pilot plant" (PDF). Oil Shale. A Scientific-Technical Journal. Estonian Academy Publishers. 26 (2): 108–113. doi:10.3176/oil.2009.2.03. ISSN 0208-189X. Retrieved 2016-10-29. ^ "Atomenergoproekt have completed a conceptual design for 8 x UTT-3000 complex in Uzbekistan (Sangruntau)". TTU Ltd. 2012-11-20. Archived from the original on 2014-03-09. Retrieved 2013-03-31. ^ Jafarova, Aynur (2013-05-13). "Oil-shale processing plant to be commissioned in Uzbekistan by 2016". AzerNews. Retrieved 2014-03-10. ^ "Uzbekistan postpones shale plant construction". Trend News Agency. 2015-12-29. Retrieved 2016-03-25. ^ "Yearbook 2011" (PDF). Viru Keemia Grupp AS. 2011. Retrieved 2012-05-16. ^ Koel, Mihkel (1999). "Estonian oil shale". Oil Shale. A Scientific-Technical Journal. Estonian Academy Publishers (Extra). ISSN 0208-189X. Retrieved 2007-07-21. ^ "History of the company". Viru Keemia Grupp. Retrieved 2007-07-21. ^ Ingo Valgma. "Map of oil shale mining history in Estonia". Mining Institute of Tallinn University of Technology. Retrieved 2007-07-21. ^ Schora, F. C.; Tarman, P. B.; Feldkirchner, H. L.; Weil, S. A. (1976). "Hydrocarbon fuels from oil shale". Proceedings. American Institute of Chemical Engineers. 1: 325–330. A77-12662 02-44. ^ a b IEA (2010). World Energy Outlook 2010. Paris: OECD. pp. 165–169. ISBN 978-92-64-08624-1. ^ Rapier, Robert (2006-06-12). "Oil Shale Development Imminent". R-Squared Energy Blog. Retrieved 2007-06-22. ^ Schmidt, S. J. (2003). "New directions for shale oil:path to a secure new oil supply well into this century: on the example of Australia" (PDF). Oil Shale. A Scientific-Technical Journal. Estonian Academy Publishers. 20 (3): 333–346. ISSN 0208-189X. Retrieved 2007-06-02. ^ Seebach, Linda (2005-09-02). "Shell's ingenious approach to oil shale is pretty slick". Rocky Mountain News. Archived from the original on 2007-04-30. Retrieved 2007-06-02. ^ Johnson, Harry R.; Crawford, Peter M.; Bunger, James W. (March 2004). "Strategic Significance of America's Oil Shale Resource. Volume II Oil Shale Resources, Technology and Economics" (PDF). United States Department of Energy. Archived from the original (PDF) on 2014-02-21. Retrieved 2014-02-09. ^ Tiikma, Laine; Johannes, Ille; Pryadka, Natalja (2002). "Co-pyrolysis of waste plastics with oil shale". Proceedings. Symposium on Oil Shale 2002, Tallinn, Estonia: 76. ^ Tiikma, Laine; Johannes, Ille; Luik, Hans (March 2006). "Fixation of chlorine evolved in pyrolysis of PVC waste by Estonian oil shales". Journal of Analytical and Applied Pyrolysis. 75 (2): 205–210. doi:10.1016/j.jaap.2005.06.001. ^ Veski, R.; Palu, V.; Kruusement, K. (2006). "Co-liquefaction of kukersite oil shale and pine wood in supercritical water" (PDF). Oil Shale. A Scientific-Technical Journal. Estonian Academy Publishers. 23 (3): 236–248. ISSN 0208-189X. Retrieved 2007-06-16. ^ Aboulkas, A.; El Harfi, K.; El Bouadili, A.; Benchanaa, M.; Mokhlisse, A.; Outzourit, A. (2007). "Kinetics of co-pyrolysis of Tarfaya (Morocco) oil shale with high-density polyethylene" (PDF). Oil Shale. A Scientific-Technical Journal. Estonian Academy Publishers. 24 (1): 15–33. ISSN 0208-189X. Retrieved 2007-06-16. ^ Siirde, Andres; Martins, Ants (2009-06-07). Oil shale fluidized bed retorting technology with CFB furnace for burning the by-products (PDF). International Oil Shale Symphosium. Tallinn, Estonia: Tallinn University of Technology. Archived from the original (PDF) on February 24, 2012. Retrieved 2009-05-22. ^ Cleveland, Cutler J.; Costanza, Robert; Hall, Charles A. S.; Kaufmann, Robert (1984-08-31). "Energy and the U.S. Economy: A Biophysical Perspective". Science. American Association for the Advancement of Science. 225 (4665): 890–897. Bibcode:1984Sci...225..890C. doi:10.1126/science.225.4665.890. ISSN 0036-8075. PMID 17779848. ^ Mittal, Anu K. (10 May 2012). "Unconventional Oil and Gas Production. Opportunities and Challenges of Oil Shale Development" (PDF). Government Accountability Office. Retrieved 22 December 2012. ^ a b Burnham, A. K. (2003-08-20). "Slow Radio-Frequency Processing of Large Oil Shale Volumes to Produce Petroleum-like Shale Oil" (PDF). Lawrence Livermore National Laboratory. UCRL-ID-155045. Retrieved 2007-06-28. ^ "Environmental Impacts from Mining". The Abandoned Mine Site Characterization and Cleanup Handbook (PDF). United States Environmental Protection Agency. August 2000. pp. 3/1–3/11. Retrieved 21 June 2010. ^ Raukas, Anto (2004). "Opening a new decade" (PDF). Oil Shale. A Scientific-Technical Journal. Estonian Academy Publishers. 21 (1): 1–2. ISSN 0208-189X. Retrieved 14 May 2008. ^ "Driving It Home. Choosing the Right Path for Fueling North America's Transportation Future" (PDF). Natural Resources Defense Council. June 2007. Retrieved 19 April 2008. ^ Bartis, Jim (26 October 2006). Unconventional Liquid Fuels Overview (PDF). World Oil Conference. Association for the Study of Peak Oil & Gas – USA. Archived from the original (PDF) on 21 July 2011. Retrieved 28 June 2007. ^ Speckman, Stephen (22 March 2008). "Oil-shale 'rush' is sparking concern". Deseret Morning News. Retrieved 6 May 2011. ^ a b "Chapter 4. Effects of Oil Shale Technologies". Proposed Oil Shale and Tar Sands Resource Management Plan Amendments to Address Land Use Allocations in Colorado, Utah, and Wyoming and Final Programmatic Environmental Impact Statement (PDF). Bureau of Land Management. September 2008. pp. 4‑3. FES 08-32. Retrieved 7 August 2010. ^ "Critics charge energy, water needs of oil shale could harm environment". U.S. Water News Online. July 2007. Archived from the original on 18 June 2008. Retrieved 1 April 2008. ^ Al-Ayed, Omar (2008). "Jordan Oil Shale Project". Al-Balqa` Applied University. Archived from the original on 3 June 2008. Retrieved 15 August 2008. ^ Fischer, Perry A. (August 2005). "Hopes for shale oil are revived". World Oil Magazine. Gulf Publishing Company. Archived from the original on 9 November 2006. Retrieved 1 April 2008. ^ "Greenpeace happy with part closure of shale oil plant". Australian Broadcasting Corporation. 22 July 2004. Retrieved 19 May 2008. ^ Anderson, Campbell (2 May 2002). Greenpeace vs the future of Australian oil shale (PDF). The 53rd Sydney Mining Club. Sydney. Retrieved 10 April 2009.